Will Daniel Murphy become next victim of Mets’ ‘Santa curse’? 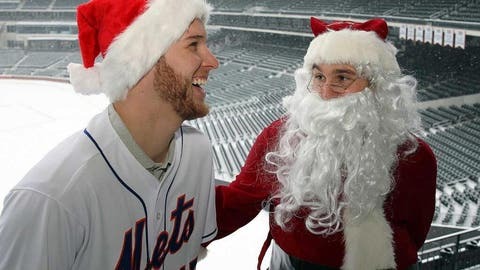 Zack Wheeler and Daniel Murphy, as Santa, attend a holiday party at Citi Field. Will Murphy be able to avoid the team's curse? For years now, almost every player who has donned the Santa Claus outfit at the team’s annual Christmas party has been destined for some sort of bad break the following season. Whether they were a victim of injury, struggled mightily on the diamond or were even shipped to a different team, the red suit and white beard has not been a lucky look for Mets players. Each year a different player takes on the role of Santa, but New York may need to start combing its local malls for the gig in upcoming years. Anthony DiComo of MLB.com detailed the unlucky history of the past players who were Kris Kringle for a night, and the good cheer certainly doesn’t last very long for these guys. The curse can be traced back to its origin in 2004, when Mike Cameron was cast in the role, only to suffer a season-ending injury in August that ultimately led to the end of his time with the Mets. Kris Benson became the next victim in 2005, and while his off-the-field issues regarding his ex-wife are certainly proof in itself of the curse, he was also traded to Baltimore just a month after the holiday party. The bad luck continued throughout the years as Jeff Francoeur’s batting average took a hit and he lost his starting job, David Wright had one of his most unproductive seasons in 2010, and R.A. Dickey was traded days after the party in 2012. When it comes to the Mets, it seems Jolly Old St. Nick may as well be the Grinch. This year, it was Daniel Murphy’s turn to churn out some "Ho, ho, ho’s" at the annual event, but the second baseman — whose name has already been brought up in trade talks — will look to once and for all end the madness. The odds certainly aren’t in his favor, but if anyone’s due for a Christmas miracle, it’s certainly the Mets. Check out DiComo’s full list here.